Anyone who knows me knows that I’m a fan of hill sprints. You’ll be hard pressed to find a conditioning exercise that’s more effective than regularly running a steep hill. Hill sprints aren’t just physically beneficial however. There’s a mental aspect as well that is worthy of a discussion. Don’t just take my word for it though. 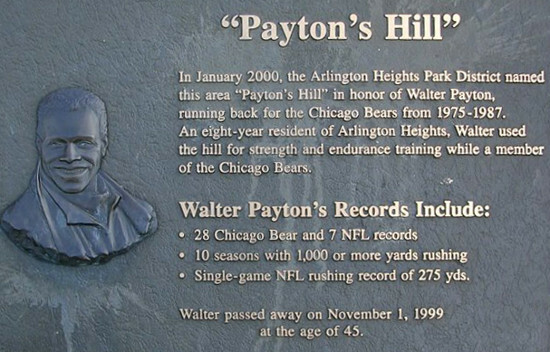 In the video that follows, you can hear Walter Payton (one of the greatest athletes ever) summarize the benefits of hill sprints in a few short words. Long time readers of the blog have likely seen me reference Walter Payton before. He was one of my early inspirations. The short clip below actually comes from a video that I’ve shared in the past. I’ve trimmed it down so that the real message can be conveyed quickly and conveniently. Pay particular attention to what he says about being humbled by the hill and how there is no winning when you continually set new goals. As a former athlete and current coach, I’m not ashamed to admit that I despise losing. I’m as competitive as anyone. Whether I’m working the corner in a world championship fight or playing a friendly game of rock-paper-scissors, I always come to win. With that said, when I’m sprinting hills, I know that the hill will eventually win. But my competitive side pushes me to do everything in my power to delay the hill’s victory. So, at the end of the session, even if I’ve been defeated, I walk away from the hill a stronger person (physically and mentally). Another benefit of hill sprints is that they never get easier. You just get better. And that’s a lesson that many athletes need to hear. There’s no such thing as being in such good condition that you never get tired. As the legendary Vince Lombardi once said, “Fatigue makes cowards of us all.” All means everyone. There are no exceptions. No one is too good for fatigue. I’ll continue by saying that when you become used to giving all you have, you’re better prepared to give everything you have when challenged during a competition. The last thing that you want is to be pushed outside of your comfort zone for the first time during an actual event. That’s a feeling that you should already be accustomed to through training. Hill sprints are ideal in that regard. You’ll be challenged, you’ll be pushed outside of your comfort zone, and you’ll be forced to deal with fatigue. And you’ll eventually realize that fatigue isn’t the monster that it’s often made out to be. As you become more familiar with its presence, you become better at hiding it and/or working through it. In summary, I’ve been taking professional fighters out to run hills for as long as I can remember. Yet, after all these years, the hill remains undefeated. Both Olympic champions and professional world champions have all succumbed to hill. There is no winning. The losses have been beneficial though as every fighter who’s run the hills has become much more difficult to defeat (whether on the hill or inside the ring). And ultimately, that’s all we can ask for. Continuous improvement is what training is all about and hill sprints can certainly aid many athletes in that pursuit. The post The Mental Aspect of Hill Sprints appeared first on RossTraining.com.